Live music 6pm to 8pm music by Anna P.S. and if we raise enough we hope to donate to the pet rescues too! Music ON The Patio - 6pm to 8pm Following the Wine and wags! This will be a shopping event with live music. Music By 3rd String. 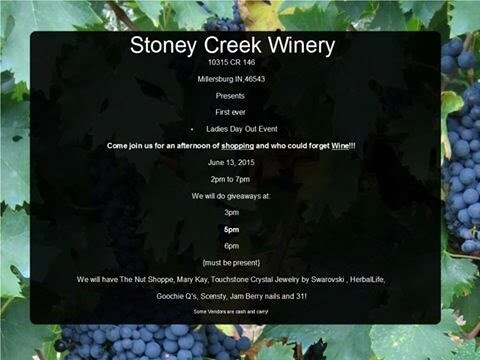 come join us for an afternoon of shopping and don't forget the wine!!! We will have 20 vendors for you to shop! The Nut Shoppe, Mary Kay, Touchstone Crystal Jewelry by Swarovski, HerbalLife,Goochie Q's, Scensty, Jam Berry Nails, and Thirty-One. Wine tastings and giveaways.